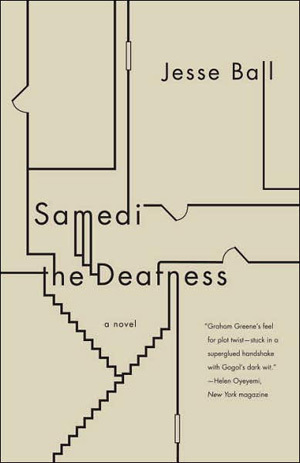 According to Samedi the Deafness, Jesse Ball’s debut novel, a verisylum is an institution established for the treatment of chronic liars. What it is, essentially, is a labyrinth, where walls shift continuously, passageways seal unexpectedly, and doors that were meant to open on a room lead nowhere. And, to top it off, the verisylum may be run by liars. Yet the idea and consequences of lying as such have little to do with Samedi’s plot. Bell is more interested in portraying a world where lying is commonplace, and the methods devised to curb it are useless. The novel’s protagonist is James Sim, a mnemonist — that is, one who can memorize large amounts of data — living in the DC area. One Sunday morning while strolling through a park, James encounters a man dying from multiple stab wounds. With his last breaths, he informs James of a conspiracy he’s been involved in, led by a man named Samedi (French for Saturday). Convinced that the dying man was out of his mind, James tries to dismiss the caveat. An hour later, however, James reads a newspaper article about a man who committed suicide on the White House lawn. Attached to the man’s body is a note, warning the country of a terrorist attack set to take place in a week’s time. “Seven days, then the rod,” it reads. The note is signed by one Samedi. From this point, James stumbles through the looking glass. He has strange encounters with a young woman who goes by three different names: first Anastasia, then Lily Violet, then Grieve. Eventually James is abducted and taken to the verisylum. The challenge for a writer in Ball’s situation is the creation of a world that retains its familiarity while abiding by a slightly different set of rules. In attempting to hold a distorted mirror up to our accepted reality, authors like Ball run the risk of becoming obtuse and abstract, to the point where the work becomes disconnected from the reality it’s attempting to represent. Ball handles this dangerous terrain with the nimble skill of Kafka, converting the consciousness’s smallest paranoia into a ubiquitous dread. Once situated in the verisylum, James becomes exposed to the hazards of its rules and design. The verisylum, he learns, was developed by one Margaret Selm, a 19th century psychologist. Without getting too wrapped up in psychological jargon, Selm believed that the act of lying compromised the identity of the individual, and the only way to combat it was to, in a sense, form a new identity. To that end, Selm constructed an environment run on a set of arbitrary rules meant to dictate the manner in which its residents think, speak, and behave. Lying is permitted in the verisylum; the idea is that these rules create a new kind of truth, and thus a new kind of identity free from falsehood. The danger is that the truth becomes singular and unchallenged; even though everyone is free to lie, the ‘truth’ is still tacitly controlled by those who run the verisylum and understand the rules enough to manipulate them. Thus, other than the people in charge, residents are left without any sense of individuality. They all follow the ‘one truth,’ the unquestioned rule. They even assume the same names, McHale for men and Grieve for women. As James attempts to unravel the terrorist plot, he is confronted with the challenge of maintaining a grip on his own thoughts, of maintaining his identity in a place where character itself has been effaced. Ball, who is also a poet, is well-versed in the currency a single word can carry. His prose is lean and economical, yet still carries an elusive, poetic punch. In one of his ruminations on fatalism and death, James imagines a scenario of a doctor pitted against death in a game of chess. Ball’s ideas concerning the verisylum remind one of Walter J. Ong’s explorations of knowledge in oral cultures: “In oral cultures, knowledge, once acquired, had to be constantly repeated or it would be lost”. Again, we see the reflection of our own reality in the mirror held up by Samedi. Truth — regardless of its merit — is only as legitimate as its constant integration in our consciousness: truth through repetition. The effects are seen on both sides of the present-day war on terror: there’s a certain amount of identity abdication involved in the search for one lasting, unquestioned truth, be it in American patriotism or Muslim extremism. Underneath all the theorizing and questioning of words and their truth value, Samedi is a good, old-fashioned thriller, packed with fantastic plot twists and unsettling intrigue. The novel requires patience, though: Ball has a fondness for the MacGuffin, a plot device that motivates the characters or advances the story, but has little or no actual relevance to the story. Thus, Samedi manages to be captivating in an indirect way; until the final quarter of the novel, the terrorist plot serves as a sideshow to the goings-on of the verisylum, which in turn comes to resemble an America many citizens now perceive: a political system that is powerless to prevent its own duplicity in the activities of liars, who in turn may very well be terrorists themselves. James becomes more involved in deciphering the puzzles of this mysterious place, believing it to be intertwined with the terrorist plot, with Samedi, and what may be the end of life as he’s known it. The suspense builds all the way until the final pages, to a lasting, haunting revelation.